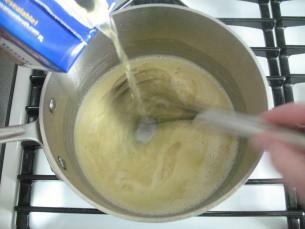 There are many, many different ways to make gravy, using slightly different techniques and ingredients. All gravies, no matter how they are made, should have no lumps, should be smooth as silk and should have no taste of raw flour. In this post, I am going to show you how to make two different gravies – a classic all-purpose gravy and then a really quick gravy. 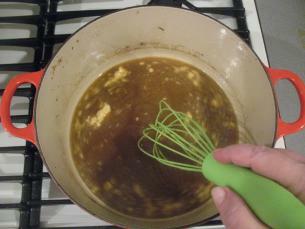 Then, at the end of this post, there are links to two videos which show how to make gravy with pan drippings, as well as links to three photo-tutorials on other ways to make gravy. 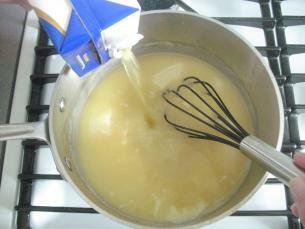 This classic all-purpose gravy is made by first cooking flour and butter together (that’s called a roux – pronounced roo) and then adding cold stock and cooking it until it has thickened and is smooth as silk. This recipe makes four cups of gravy which is great for entertaining. 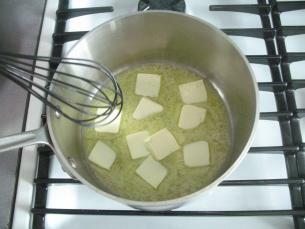 On low (to medium-low) temperature melt the butter until it is foamy. 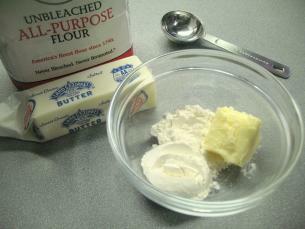 Add 1/2 cup of all-purpose white flour to the pan. 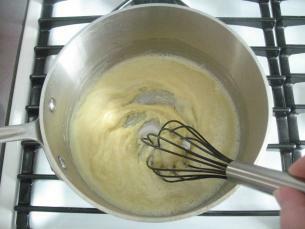 Keep whisking and cooking (over very low heat) until it smells like a pie is cooking in the oven! That means the flour is cooked and your gravy will not end up having a “pasty” flavor to it. Brace yourself, as this could take anywhere from 6-to-12 minutes to get cooked! 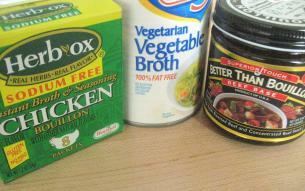 I will be using chicken stock for this recipe, but you could use vegetable or beef stock or a combination of stocks. …all the stock is absorbed. 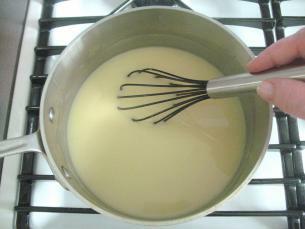 …whisking until the stock is again absorbed. 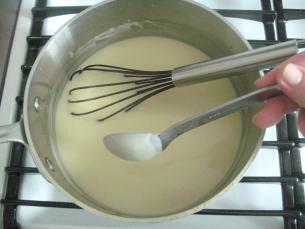 All of the stock will get absorbed and it will be smooth as silk again! 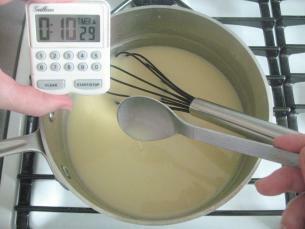 The stove should still be set at low as you continue to cook the gravy. After 10 minutes, my gravy was still was not quite thick enough. See below how it drips off the spoon. 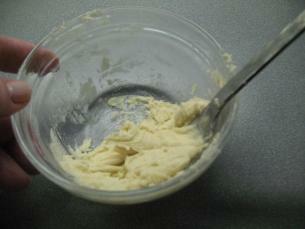 At about 12 minutes, I added 1/3 cup of cream. 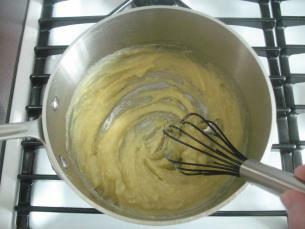 This adds such a rich flavor and texture to the final gravy. Within two minutes of adding the cream, the gravy was perfect! See below how it now coats the back of the spoon. Taste the gravy, and add some salt (if you think it needs it) and some white or red pepper. This is ready to serve! 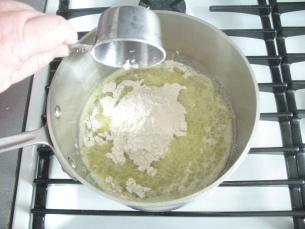 In terms of amounts, the general rule of thumb is 2 tablespoons of flour, plus 2 tablespoon of butter to 1 cup of broth. Broth from a can works beautifully for this recipe, although I am using strained stock from a just-cooked beef pot roast. (Waste not, want not!) 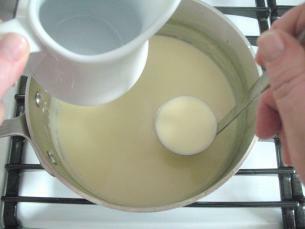 The excess fat needs to first get skimmed off the top. Canned stock does not have this excess fat. Pour the stock into the pot. (I’m using the same pot that I cooked my beef pot roast in.) Turn the heat on medium and heat the stock. 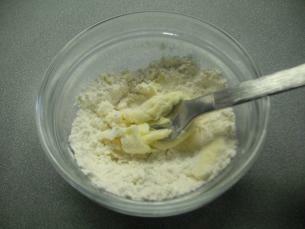 Put the flour and butter into a small bowl. 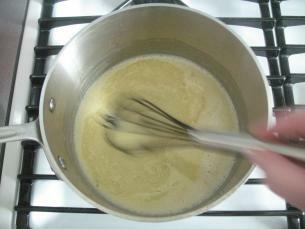 Add the beurre manie to the hot stock. 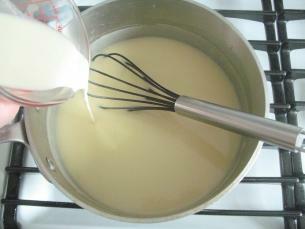 Vigorously whisk together the stock and the flour-butter paste. 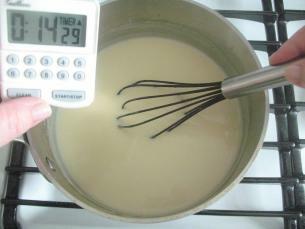 …cook the gravy until it is thickened. There should be no “pasty-flour” taste to the gravy. This could take up to 10 minutes. 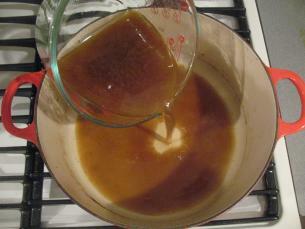 Taste the gravy to see if it is cooked and if it needs salt and pepper. 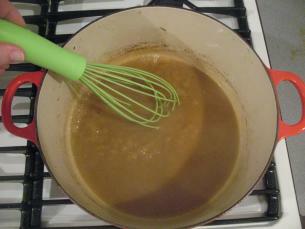 Sometimes homemade gravy is just not the color you want it to be, and occasionally the flavor needs a bit of a boost. In the spice section of the grocery store you can buy flavor enhancers for gravy. Names like Bisto, G Washington’s Rich Brown sauce, Gravy Master Seasoning and Browning Sauce, and Kitchen Bouquet Browning & Seasoning Sauce are available at my grocery store. Enhancers are made of a combination of vegetable extracts, caramel coloring, preservatives, salt, etc. Some people have actually added things like soy sauce or coffee granules to darken their gravies! Many serious cooks look down on the whole idea of using enhancers. That’s their privilege, but I think beginners should be given more latitude to learn a step at a time using convenient ingredients! Even experienced cooks use these products. 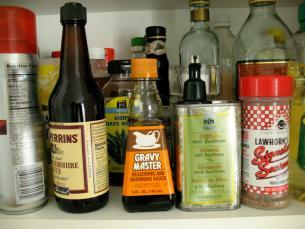 My mom always had a product called Gravy Master in the cupboard and I must admit I have followed her tradition! Enhancers pack a powerful punch and should be used sparingly. They not only add flavor but they also add color to the gravy as well. 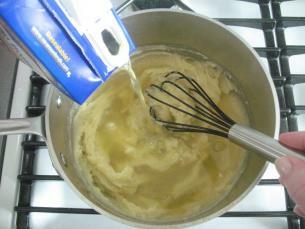 Just a few drops can turn pale gravy into a color darker than dark chocolate! Be sure to read the directions on the back of the particular brand you have purchased just in case they say otherwise. 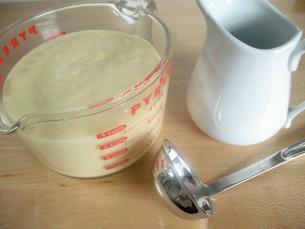 Homemade “flour-thickened” gravy should be stored in the refrigerator in an airtight container and used within two days of making it. 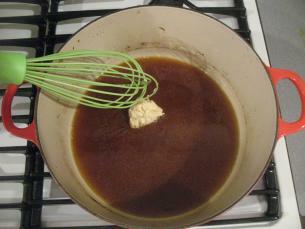 When reheating the gravy bring it to a boil, whisking constantly, and then keep at simmer until ready to serve. 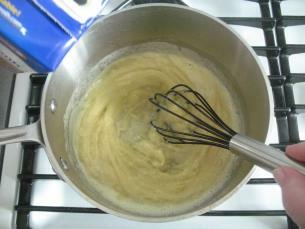 Flour-thickened gravy can be frozen for up to 3 months. 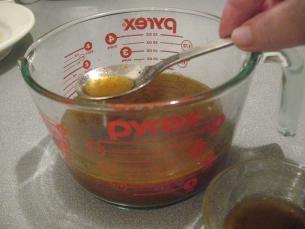 Freeze the gravy in manageable portions. I like using zip-lock freezer bags. Be sure to squeeze out all the air and flatten the gravy. 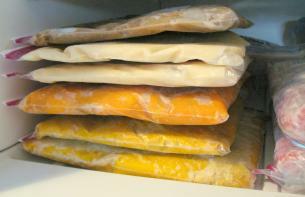 It will take up much less space in the freezer this way. 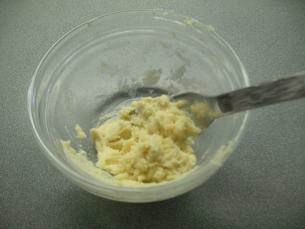 After the gravy has defrosted it may look like it has separated or curdled. 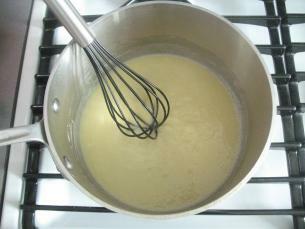 Vigorously whisk the gravy as you are re-heating it, in a sauce pan, and it should return to its original texture. 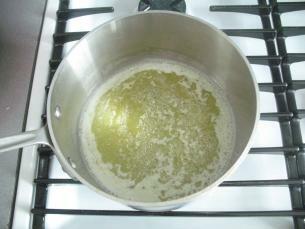 You may have to add a few drops of water or stock to the pan as well. Epicurious has an excellent video on How to Make Gravy by deglazing a roasting pan first. The Mayo Clinic also has an excellent video on Making Healthy Gravy. 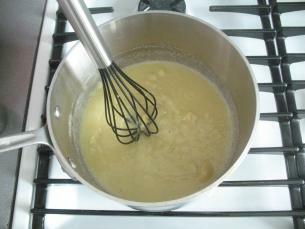 Their recipe uses cornstarch instead of butter and flour to thicken the gravy. 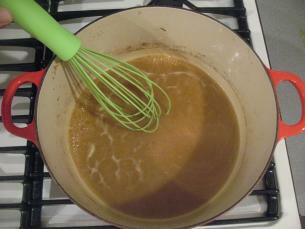 Instructables has a great photo-tutorial on a superb looking Vegetarian Mushroom Gravy. For lovers of Giblet Gravy, head over to Cook Like Your Grandmother for a very well done photo-tutorial. 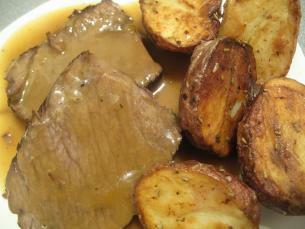 Martha Stewarts Perfect Gravy is made with Madera Wine. 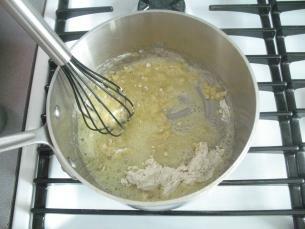 She thickens her gravy by making a “slurry” of giblet stock and flour in a jar. I am new to your blog and new to cooking. I found this site when I googled, “how to brown beef” because I was interested in making spaghetti with meat sauce. Thanks for all the useful information and keep up the great work! I really love your posts and look forward to reading more. I also look forward to trying new things in the kitchen and gaining more confidence as I learn to cook various dishes. Thanks again! Hi Marielle, and welcome to startcooking.com! When learning how to cook I really do believe that a picture is worth a thousand words. Good Luck and be sure to let me know if you have any questions! My wife has been preparing Thanksgiving for 30 years. This year, she was distracted and put the turkey in the oven breast down, which I discovered when I started to carve. We flipped it right side up and put it back in the oven for 20 minutes. She was distraught, but it was the most delicious, moist turkey we’ve ever had! I think the juices from the wings seeped into the breast. We’re going to do it again next year! Hi Larry, it sounds like you are onto something here! Well done and I am so glad your new technique turned out to be such a success! Thank you for sharing such a detailed information on brown gravy cooking. Glad to see you’re allowing comments again. Thanks Colin – I’ve had a lovely vacation! I’m a guy who loves his gravy and never learned to make one til now. Thanks! I’m a guy who loves his gravy but never learned to make it til now. Thanks!